Hemingray was the largest manufacturer of insulators used for telegraph and telephone poles from the 1850s to the 1950s. Many of the glass companies making insulators also make bottles, and even today collectors display vintage bottles with insulators; shows throughout the country are combined insulator and bottle shows. If you want to display your glass insulators or bottles, you'll want to clean them first. Cleaning glass insulators and bottles have common elements. Clean insulators with a toothbrush and baking soda mixed with water to make a paste, and brush into the crevices of the insulator. 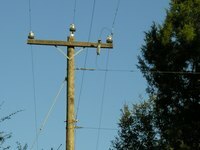 Threaded or unthreaded insulators exist, and the threads may have wood residue where the insulator sat on a post. Unthreaded insulators may have a putty or glue that held them on the post. Remove whatever you can with the toothbrush and baking soda. Baking soda is a mild abrasive that will not damage the glass. Oxalic acid is a cleaning powder that removes rust, but it is not safe for carnival glass, opalescent glass or flashed amber, according to Insulators.info website. Zud and Barkeeper’s Friend are name brands of oxalic acid cleaners, and others are available at your local grocery store. Make a paste with oxalic acid and water, and rub it on the glass insulator where there is a rust stain. Let it sit a minute or two, and scrub with the toothbrush. Rinse and dry the insulator. Use white vinegar to remove water residue and accumulation from years of the insulator weathering on the pole or lying in a field. Pour white vinegar in a deep bowl, and let the insulator soak overnight. Brush its teeth and threads the next morning. Rinse with clear water to remove the vinegar. Stovetop cleaner removes wire deposits and metal marks from glass insulators. Glasstop cleaners are a thick liquid cream you can pour on the toothbrush to clean a glass insulator. Scrub with the toothbrush, and rinse with clear water. Always rinse with lukewarm or tepid water as any fast changes in temperature may crack glass.